Immerse your community in local nature. Celebrate all that is extraordinary in your region. Grow Wild for beautiful backyards & healthy spaces. Now, you can create your own EcoTrail at a new or existing trail, tour, street or wayside stop as part of Carolinian Canada’s growing EcoTrail network. Showcase the unique nature of your community. Grow a green community hub. An EcoTrail is a place to connect... with nature, people and a healthy future. Whether you manage a nature trail, want to 'green up' your site or aim to bring people together, try this fresh and healthy community-building approach. Joining the EcoTrail Network is a wonderful way to build positive connections, green communities and healthy spaces. EcoTrails are win-win-win for environment, economy and social equity. Grow Your Idea: You can join the network even if you are just starting out with a piece of land or even just a concept. Use the network to explore ideas, see what others are doing, connect with experts, find out about new ways of showcasing nature to grow your idea and trail. Enhance Your Trail: You can join the network if you have a trail that needs improvement. Plan out what you want to do to make it wildlife and people-friendly. Grow Your Community: Think beyond the traditional nature brochure and 'text book' signage. Use the network to access new technology, link to new sectors and spark imaginations to grow your community. EcoTrails connect local to global. Your EcoTrail can link your community to the Carolinian Canada network from Toronto to Windsor; to local to international visitors; and to a healthy future for the planet. EcoTrails connect along the trail and beyond into the greater ecosystem, community and ecoregion. Contact us to find out more.Our network can help you plan an EcoTrail to celebrate your community. EcoTrails support the 3 E's of sustainability. Scroll down to explore who benefits. Contact us to find out more. Our network can help you plan an EcoTrail to celebrate your community. Who will benefit from the Carolinian Canada EcoTrail Network? Scroll down to explore if your trail is a good candidate for an EcoTrail. Join to showcase the unique nature of your site, street, tour or trail. Use this checklist to explore if you or your group can benefit from the EcoTrail Network. EXPLORE - Immerse your community in nature. Your group has a goal to manage or improve habitat. Your site has public access or by permission or guided tour. SHARE - Celebrate all that is extraordinary. Your group will work with us to establish a virtual trail head on the Carolinian Canada EcoTrail website with a link to and from your website. You want to share with your community how you save, steward and seed local nature using best practices. ACT - Grow Wild for beautiful backyards & healthy spaces. You can access local networks to build interaction at your site. We can help you promote your site and your message across the Zone. An EcoTrail showcases the unique nature of your community. Your trail may be a vibrant green community hub, need to be refreshed or a vision to be implemented. 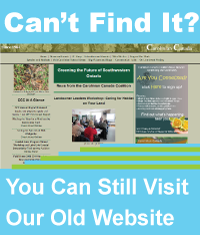 The Carolinian Canada EcoTrail Network can help you!